We’ve officially arrived at day 3 of my New York Fashion Week recaps. Day three was a great one, if only because the insane heat wave NYC was having broke haha. Day three brought two shows with it; the first being a presentation by Yuna Yang. Yuna Yang is a designer from Seoul, currently living in Manhattan. I first saw her collections last fall NYFW when she did a beautiful presentation in a garden. This year she presented her SS19 collection in a church with a live band. After Yuna Yang I headed to Pier 59, one of the secondary locations for NYFW shows to check out a unique show – something called the Oxford Fashion Collective. The Oxford Fashion Collective put on three shows during fashion week, and they showcased a select group of young emerging designers in each show. I really wanted to see at least one of the three shows during my NYFW as I like the idea of seeing new designers, and getting to see so many collections at once. Today I only had one event on the go (unless you count ordering late night Shake Shack with my roommate and spending the evening in our hotel room in our pajamas an “event” haha). After both the shows I headed to the Style Coalition Lounge with my friend Lizzie from Lizzie in Lace. Launchmetrics, Style Coalition, and eBayFashion came together and rented a space across from Spring Studios (the main location for NYFW runway shows). They decked this space out into a lounge and invited influencers and media to use this space as a place to go between shows to relax and recharge, to have a cocktail and some snacks, and even to get your hair and makeup touched up! They had amazing hair and make-up teams on site, and the food and drinks were really cool. There were custom made tequila cocktails (pictured below) and snack wise in addition to standard appy’s, there was an old fashioned popcorn maker and a candy station where you could fill a grab bag with dozens of different candy options (.. there were sour patch kids, so I was basically in heaven). One of the coolest parts though, was that eBay Fashion had decorated a corner of the space in the prettiest lavender hues and hired a Vogue photographer to take attendees photos in the living room set up! It was so fun to do a mini photo shoot with this amazing photographer! I’ve included below two of the photos he took of me. I also loved that unknowingly my outfit perfectly matched this lavender backdrop. #AccidentalFashionWin. After spending our evening at the Lounge, Lizzie and I headed back uptown to our hotels. I was so exhausted (day three gets me every. damn. time.) and so spending the evening in my hotel with my roomie Megan (The Fashionista Momma) was exactly what the doctor ordered! I’ll be back on Friday with a recap of Day 4! Stay tuned! What pretty spring collections! I love your pink suit, looks fabulous on you! Sounds like you had a great time at NYFW!! Thank you for sharing the show recaps – not many bloggers do these days! I definitely did. And thanks Mollie; I’m so glad you like them! I like sharing the new collections and my thoughts on the trends. 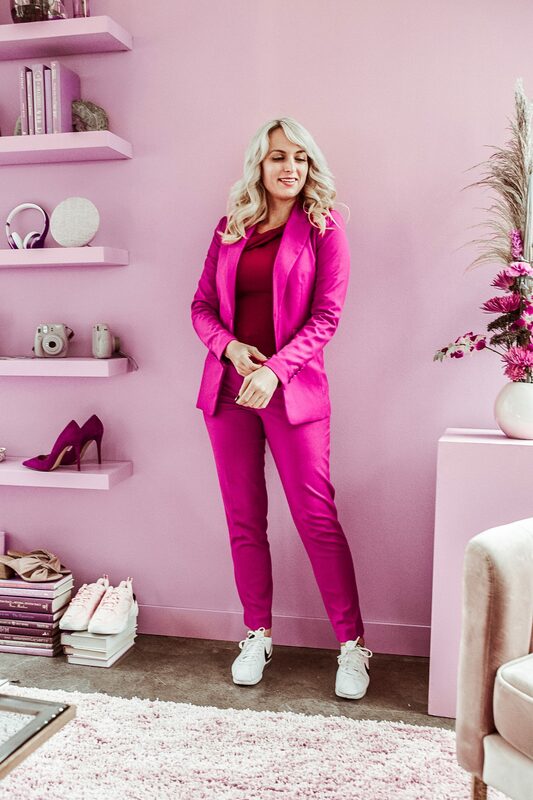 How adorable are you in this pink suit! It looks like the perfect day at NYFW! Hehe thanks Megan, you are so sweet! I wish I got to meet you at fashion week! I am already feeling the spring vibes. You looked fabulous in that pink suit. I love the first collection you got to see- I feel like they are pieces I’d actually wear! 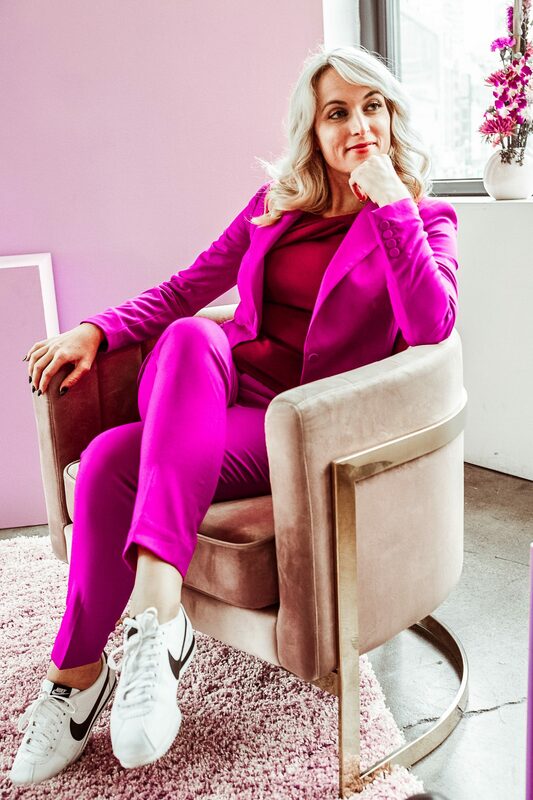 And omg obsessed with your pink power suit!! I totally agree! Yuna Yang always makes pieces that are very real-world wearable, which is great. I love how feminine and springy this collection is. It looks like you had an amazing time! I LOVE that hot pink suit you wore! Thank you so much Ruth! It’s an old H&M suit and I am so obsessed with it! Yuna Yang looks right up my alley! So feminine and sweet! It really is so pretty! One of the more wearable collections I saw during fashion week. I totally had a blast, and ahh thats so cool you used to work it! You should go again soon! Glad you had so much fun. I always envy those who get to go. Aw thanks girl. I hope you get to go one day too! Okay our pink suit!! Amazing!! Looks like such a fun day at NYFW! How did I miss you in this pretty pink suit! NYFW is s blast. Love all of the sneak peeks about the spring collections. And, love your pink suit!! GORGEOUS! !